In the family where I grew up, pancake/biscuit mix was a staple. I never really considered that it might not be necessary. Then I got married. Jeremy thought I was crazy, because his family never used the stuff. So, reluctantly, I tried the from-scratch method. To my surprise, I realized that it was not much harder at all. And, while pancake/biscuit mix is cheap, the ingredients are even cheaper. I now make biscuits from scratch every time. I am having some fun with them, and working to perfect my super-quick version. These are convenience food at its best, because you end up with something hot and fresh that only cost you a few cents to make. They are not much to look at, but you are going to eat them anyway. 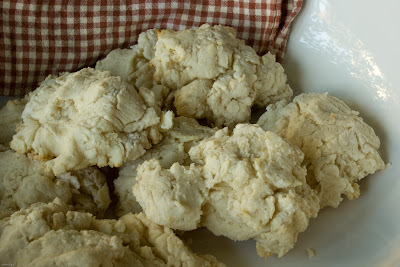 Unsightly but tasty, here is my special method for biscuits from scratch in 60 seconds flat. Turn the oven on to 400 degrees. Get out flour, baking powder, salt, milk, vegetable oil, 1 cup measuring cup, 1 tablespoon, a medium bowl, a fork, and a cookie sheet. Scoop two cups of flour into bowl. Add 1 tablespoon of baking powder, and then use the tablespoon to eyeball measure 1/3-1/4 of a tablespoon of salt. Stir with the fork. Pour 1/3-1/4 cup vegetable oil into the measuring cup, and then fill to the top with milk. Stir with fork until it looks like dough. Grab small handfuls of dough and squish them onto the cookie sheet into roundish biscuits. Bake for about 10 minutes, until they just start to look golden at the edges. Makes about ten (depending on the baker). If you want to make these more healthy, just substitute 1 cup whole wheat flour for half of the flour. Ooh! I've never thought to just plop chunks on the cookie sheet! I always roll them out, but my favorite biscuits to eat are the ones made from the leftover dough that break into pieces. Sounds like all yours end up that way!